Management of a tolerance control line and static and dynamic weighing of packages on a conveyor belt. Complete configuration of the article, of the automation time periods and of the setup parameters of the instrument. Reading of the belt and inputs status, net weight, last executed weigh and number of weighs. 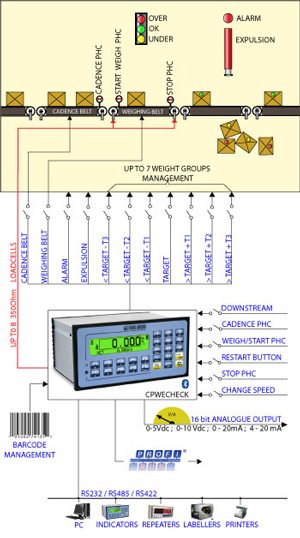 Programme on PC for optimising the weighing cycle; it's possible to monitor the status of the inputs and outputs of the instrument, transmit serial commands for managing the automation, quickly modify the parameters of the instrument, graphically view and process the weighs in order to obtain the best weighing results. Software version for managing systems that weight packages on a conveyor belt, through static or dynamic weighing and tolerance control. Thanks to the high conversion and acquisition performances and to the advanced filtering functions, it's possible to weigh and memorise an elevated number of packs/min. 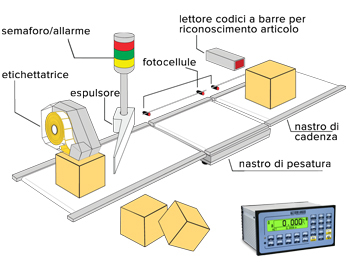 - Static or dynamic weighing, with management of pack detection photo cell. - Dynamic weighing with two START/STOP photo cells. - Static or dynamic weighing without photo cell (for Pick and Place lines). - by target, through articles database, with setting of 3 tolerance thresholds, for the physical division of the packs into 7 different groups. - by programmable weight thresholds (min/max), with articles dabatase. - by weight thresholds (min/max), through a quickly entry. Calculation and printing of the statistics and of the standard deviation of the executed weighs. Static or dynamic autozero function of the belt (up to 2% of the flow) after a programmable number of weighs. Advnaced management of bar codes, with the possibility of storing, processing, and printing 5 different codes. Automatic printing/clearing of the partial total after a programmable number of weighs. Printing with each executed weigh and eventual automatic storage into the alibi memory. Database of 1000 articles with alphanumeric description, target and programmable tolerance thresholds. Setting the density coefficient, for every article, for weighing in ml. Programmable preset tare and activation delay of the expeller for each article. Management of belt speed through analogue output, with programmable value for articles. Programming of the article in manual mode or through software on PC (Dinitools). Article selection through reading of bar code. Cycle activation, RESTART / RESET cycle and START / STOP weigh through external inputs. Management, through a cadence photo cell, of the cadence belt, for optimising the number of packs per minute weighed by the instrument. Management of the automatic expulsion or stopping of the belts for manual expulsion or weight correction. Programmable alarm activation time and tolerance indication; possibility of connection to control light. Activation of the line second speed through an external input, with automatic recalculation of the weighing time (only for weighing with two photo cells). Analogue output (optional) proportional to the weight or controlling the belt speed, with programmable values for each articles. Serial communication protocol for programming the articles and managing the cycle. CHECK Software for packages weighting on a conveyor belt functions.